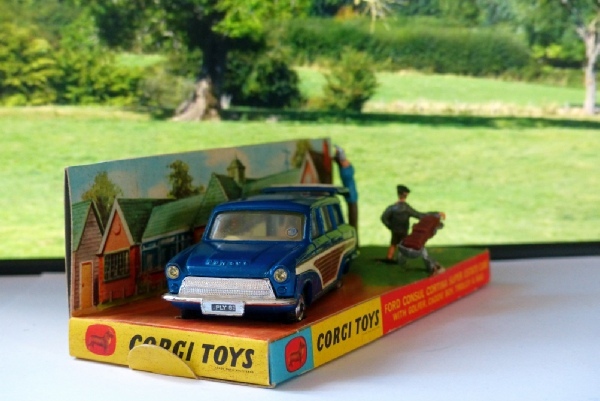 Here is a lovely complete and original Golfing Set, featuring the blue Ford Consul Cortina Estate, adult golfer, child with caddy. It comes in a nice firm box with the inner display plinth which is very crisp and bright. The car has no flaws that I have noticed and the box is like new. A brilliant example of this which is now quite a scarce set to find in this condition. The car on its own was released as #491 and can be found in red and dark grey as well as this blue. Later examples had small cast spoke-effect wheels.